Wow this is near the end, we have one more week and we are done with the #TFWOC project!! 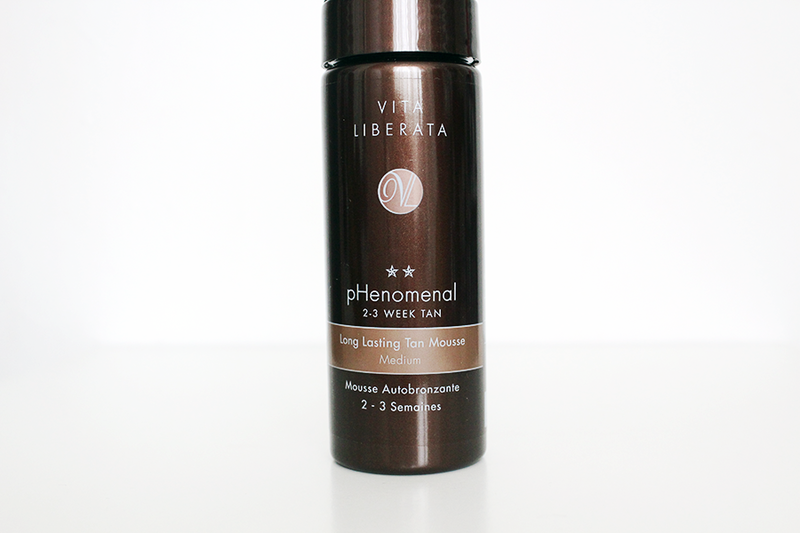 Vita Liberata is our brand for the week. Vita is a tan brand that has been used on many red carpets. Celebrities such as Kelly Brook, Holly Valance, Michelle Keegan, The Saturday's and even One Direction enjoy using Vita Liberata when they want that touched by the sun glow! pHenomenal tanning mousse, the world's first 2 - 3 week tan! This is the tan I will be reviewing for you in the shade medium. They say this tan is to last 4 times longer than any other tanning product on the market today. The pHenomenal tan incorporates new technology (pHeno2) that woks alongside the active tanning ingredient DHA to ensure that this formula takes to the skin in a way that normal tans cannot. It still contains the natural extracts that all Vita Liberata tans do, silk proteins, seaweed and ylang ylang. No parabens, perfume or alcohol are included in pHenomenal! Bonus - this is great for people with sensitive skin, so if your worried this may not be for you. Don't worry it won't irritate your skin! Make sure your skin is hair free. Exfoliate so you get rid of any dead skin, helps to make application easier and smoother. Moisturise only the areas of your skin that get a bit more drier than others e.g. knees, elbows, toes, knuckles. If you get the tan on any areas that you don't want the tan to appear wash off immediately as the colour will set in within a few minutes! Remember to read the instructions and do some research on others who have tried and tested this tan, to learn from them. It says than once this tan is applied you can wash it off in 3 - 24hours. I decided to wait until the next day to really let the tan set in and so I can see if I want to reapply a second application. I used one pump as I didn't want to load my mitt of tan, I decided to be maybe a little frugal with it as I was a little unsure, this tan is meant to last 2 - 3 weeks and the last thing I want is to load my skin with so much tan I look dirty. There wasn't much smell to this if I'm honest when I pumped it out BUT the next morning I did smell of tan! I won't lie, it wasn't a hard 'biscuit' smell but it was there once I had left it until the next morning but once I washed off the application the smell had disappeared. The tan dried pretty quickly, I had white sheets so you could imagine that they would of looked like a pig in mud by the next morning if it hadn't dried quick enough but I'm glad this is a tan that does dry pretty quickly. Above photo was taken just after the first application on one of my legs ( can you tell which one ) before I moved onto the other one. The next morning when I woke up my legs were pretty dark! Around my ankle and knee the results reminded me of red roads back in Jamaica in the country areas. Give or take 3 days it started to fade into a nice brown colour. On the 8th - 9th day of the application, the tan started to fade. I decided to show what it looks like if you don't exfoliate. It starts to shed, I read reviews before where people said that it doesn't flake / shade. I beg to differ. By the 10th - 11th day my legs were tan free. Remember I only did one application and left it on until the next morning to wash off so about 11 hours later I washed mine and didn't reapply cos it was dark enough for me. Besides the red road look around my ankles and knee, I didn't have much bad things to say about the tan. I think the main issue is if your a tanning newbie it's how much to use, do I or don't I reapply!? Trial and error. I just didn't want to be going out looking foolish so I just decided to wait out on my tan to see for myself. Is this a tan I would use again? Probably if I wanted a tan that lasts, I think it could be it. As I said I applied it once, and under a fortnight later I was tan free so if I was to do 2 - 3 applications, this could live up to it's claims.